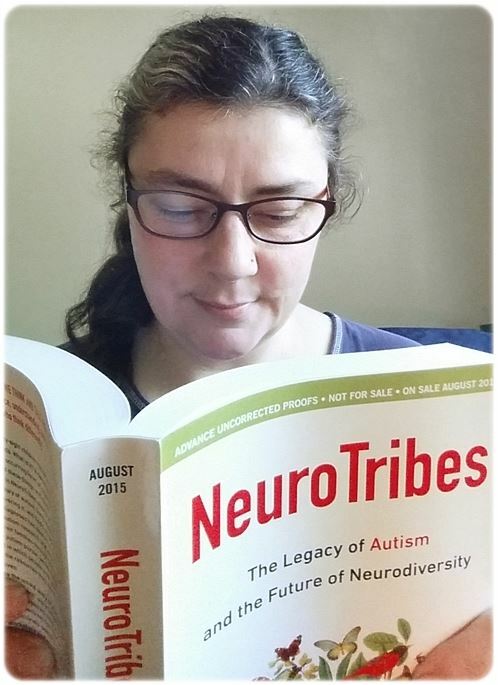 When Shannon Rosa contacted me and asked if I'd be interested in doing a guest review for Steve Silberman's highly anticipated book NeuroTribes: The Legacy of Autism and the Future of Neurodiversity, I excitedly and nervously said yes! Like so many others, I've been anxiously awaiting what I hoped would be a game changer for the Autism community and Autistic people. I've visited many book stores over the years in search of credible information or stories by people like me, especially stories and information from Autistic women. I often left disappointed and frustrated by the lack of history, compassion, accuracy and the almost non-existent input from actual Autistics like myself, finding instead a minefield of cures, desperation, martyr parents, male-dominated information and -- said with respect -- books about or by one of the most well known Autistics, Temple Grandin. I needed to know more. I needed to know how we Autistics got to here: more defined than we've ever been, and yet so divided as a tribe. What is the basis for so many of the preconceived notions about Autism? Surely our place in history, and among humankind, is not as damaged, abnormal, disposable, cure-needing people. So why are we still so overwhelmingly seen that way? These are just a few things I hoped NeuroTribes would address. Mr. Silberman has more than exceeded that hope. NeuroTribes is like finally having set of autism encyclopedias -- in my own language -- to reference. So, how did Silberman, who is not Autistic, come to write this book? In 2000, Silberman joined the first ever “Geek Cruise” to Alaska, on assignment for Wired Magazine. There he met Larry Wall, creator of Perl -- an open source programming language used around the world. When he requested to interview Larry further, it led to an invitation to Larry's home, and the disclosure that Wall had an Autistic daughter. A few months later, Silberman was working on a story highlighting Judy Estrin, a highly regarded female technologist in Silicon Valley -- and found she had an Autistic niece. Then a coffee shop talk with a friend about whether the two "geek" families' autistic children were a coincidence led to an interesting comment from a fellow patron -- there's an Autism epidemic in Silicon Valley, the person said. Silberman's curiosity was so piqued that it first led to his 2001 Wired article The Geek Syndrome, and now to his current book NeuroTribes. This hasn't been a rush-to-print project; the depth of research put into NeuroTribes is obvious. I feel I can assure those with whom I share the Autism Spectrum -- knowing many will question why a NeuroTypical person is writing our history -- that Mr. Silberman is on our side. Reading the book will really help you to understand why: I'm looking at it as a bridge that will lead to more and more of us Autistics being published, and listened to, as the authors of our history. It's a step forward, if we take it. Mr. Silberman has uncovered many personal stories of those thought to be Autistic, going back to the end of the 18th century. He clearly shows what I've always known: we've always been here! I especially enjoyed the first chapter, and meeting Henry Cavendish, the "Wizard of Clapham Common" and also the "Father of Electrical Theory," who was one hundred years ahead of his time. As Cavendish lacked the need or desire for promoting himself, many people haven't gotten to know, till now, this truly interesting character. I know many may relate, and wish they could have spent some time in his amazing world. Reading about how he put together and carried out the Cavendish Experiment in an attempt to weigh the earth's density is inspiring. What a mind! I'd read a book just about just him! I also felt the true weight of how my incorrect diagnosis of “manic depression” (BiPolar) at age 14 came at a huge cost, and never felt quite right anyway. Just as I never felt quite right in the world, nor sure where I fit in. That has also been the fate for countless of us Autistics with any sort of perceived mental difficulty or disorder, as is highlighted repeatedly in NeuroTribes. I think many people reading this book will finally feel like I did, that they aren't alone. I experienced so many moments of self-recognition as I turned the pages -- what a gift. Being able to see autism history all laid out this way has helped me come to terms with many parts of the difficult past. In fact, through Silberman's expansive research we learn that -- by virtue of our unique but valid ways of communicating and differing minds and abilities -- Autistic people have literally given the world the ability to be as connected as we are with technology. Without us, NeuroTypical people would still be in the Dark Ages!! Throughout our history, any type of mental diagnosis almost always led to being institutionalized, with many vulnerable people treated worse than with animals. (It also led to our history being interwoven with that of Nazi eugenics.) We experienced electrical shocks, sterilizations, physical punishments as "teaching." Silberman specifically covers the mistreatment of people with epilepsy, a condition many of us on the Spectrum experience. It was sobering to realize how people like me were treated, and what my fate would have been, not that long ago. Silberman doesn't sugarcoat those bad parts, and I appreciate that. Many who were leading the defining of autism seemed too blinded by their own spotlights or agendas (Kanner, Bettleheim, Lovaas). We see how painfully slow those personal agendas made any progress towards our current level of understanding, and how it didn't need to be that way. The histories in NeuroTribes weren't and aren't all bad and hopeless, though. There are heroes (including Leo Kanner, what a complex character) and free thinkers all throughout the book. My anger was calmed and replaced by such admiration for the goodness and perseverance of many people we meet. Two chapters in particular really touched me. “The Boy Who Loves Green Straws” gave me an intimate look into the lives of the Rosa Family, and my respect and affection for them greatly deepened. Having come full circle with some of my own beliefs and ideas, I know it's not easy to open up and expose yourself like that. Then “Pandora's Box” educated me about Lorna Wing, an English psychiatrist and physician who deserves far more recognition for her work advancing the acceptance and understanding of Autistic people and Autism. After reading about so many setbacks, to then be educated about Lorna's work really inspired me. I will continue to learn more about her as I grow in my own self advocacy and activism. As I got deeper into NeuroTribes and kept going back over my notes, what stood out the most for me is how Silberman uncovered and compassionately laid out every bias society has about Autism and Autistic people. (A bias is defined as a "prejudice in favor of or against one thing, person, or group compared with another, usually in a way considered to be unfair.") I'd be reading along and suddenly yell, “Oh that's where people got that bias from!” I think exposing those biases is going to be a change catalyst for so many people. To understand where we get ableist views from, to see how our hurtful ideas are sometimes rooted in outright lies, gives opportunity for change and growth. I feel this will be one of the legacies the book leaves us with: a shift in word and action which leads to a more inclusive world for everyone. I cried when I finished the book, for many reasons. Reading NeuroTribes was a journey of self-discovery, and I feel changed in a very good way for taking it. The book left me with the knowledge that even when it feels like we aren't making progress on behalf of autistic people and Neurodiversity, we truly are. That one person can make a difference, and that difference can be nurtured into something amazing that includes many. I also feel such a debt of gratitude to all those who turned the tide in a better direction, especially The Autistic Self-Advocacy Network's 2007 campaign protesting NYU's Child Study Center's billboards about the "silent public health epidemic" of childhood mental illness. In David and Goliath fashion, the underdogs won and the billboards got taken down -- and I am left with a fierce feeling of pride and self worth as an Autistic human. I'm invigorated, and have a better understanding of the type of advocate I want to be. I saw myself reflected back in this groundbreaking book, and it gave me the most complete picture of myself I've ever had. I don't care that Mr. Silberman -- who I saw call himself a “boring NT” on Twitter a few days ago -- helped give these feelings. Far too many other non-Autistics have taken too much away from us, for far too long. So I'm willing to accept and be grateful for what I see as Silberman's gift to the Autism community, and Autistic people everywhere: fostering a Neurodiverse society. NeuroTribes's overall message is clear: Accepting Neurodiversity is key. Autistic people belong here. We make the world better and smarter in so many ways, and it literally wouldn't be the same, or as interesting, without us.